Hey Diddle, Diddle, have you ever heard that riddle? Of course you have! Even if we can’t always remember all the words, nursery rhymes still bring back fond childhood memories. When we found out our older sister was pregnant with a little boy, we decided to plan her a surprise Nursery Rhyme Themed Baby Shower. We found Matthew Reinhart’s beautiful “Pop-Up Book of Nursery Rhymes” on Amazon. This is a must have book for every child! We also came across Amy Allen’s “The Little Piggy Went to Prada,” which reinvents the classic rhymes with a fashionista twist. This is a must have book for the Birkin-toting and Blahnik-wearing mommy! We found an adorable It’s a Boy Autograph Dog at Party City. We created Balloon arrangements, inspired by Twinkle Twinkle Little Star. We also printed out some of the classic rhymes and scattered them throughout the room for decor. 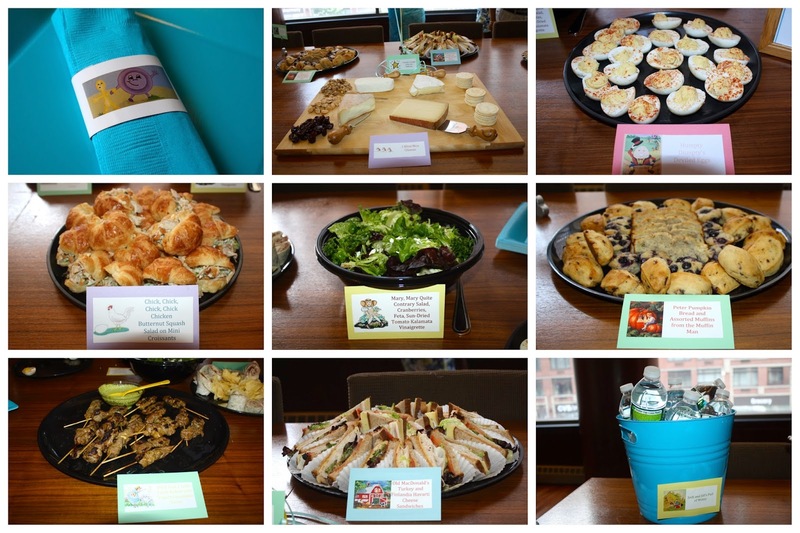 We worked with CulinAriane to create a whimiscal menu inspired by our favorite nurse rhymes. 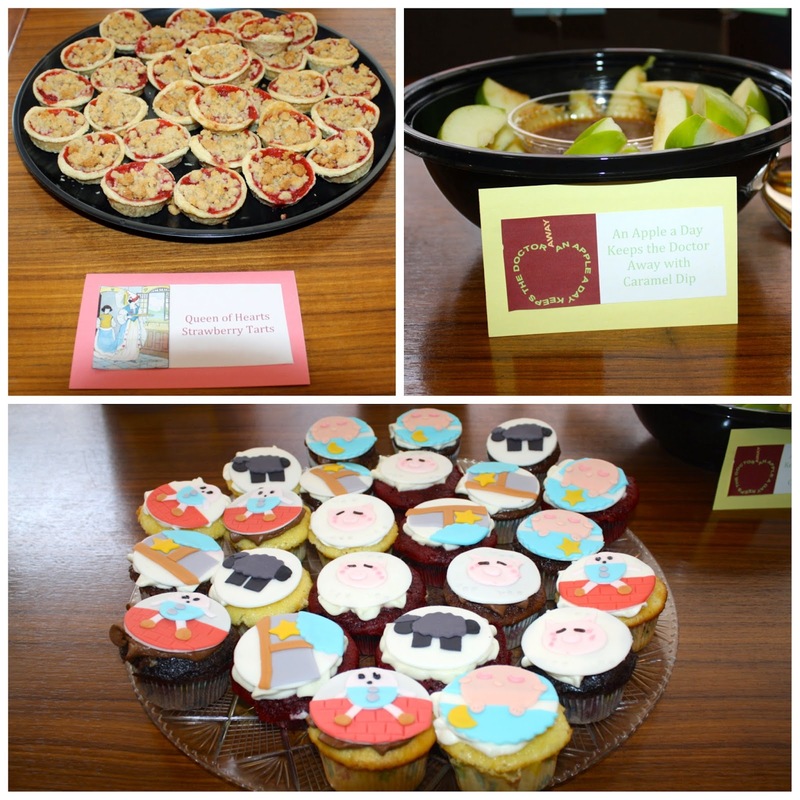 Our childhood friend, Natalie Nowrocki, created the cupcakes with the nostalgic images of Humpty Dumpty, Baa Baa Black Sheep, Twinkle Twinkle Little Star, Hush Little Baby and This Little Piggy. Trust us these cupcakes were delicious! Our specialty cocktail was a “Little Boy Blue bellini,” which was easily made with Prosecco and Blue Curacao. Jack and Jill’s pail of water was fully stocked with Poland Spring bottles. We also served red and white wine. 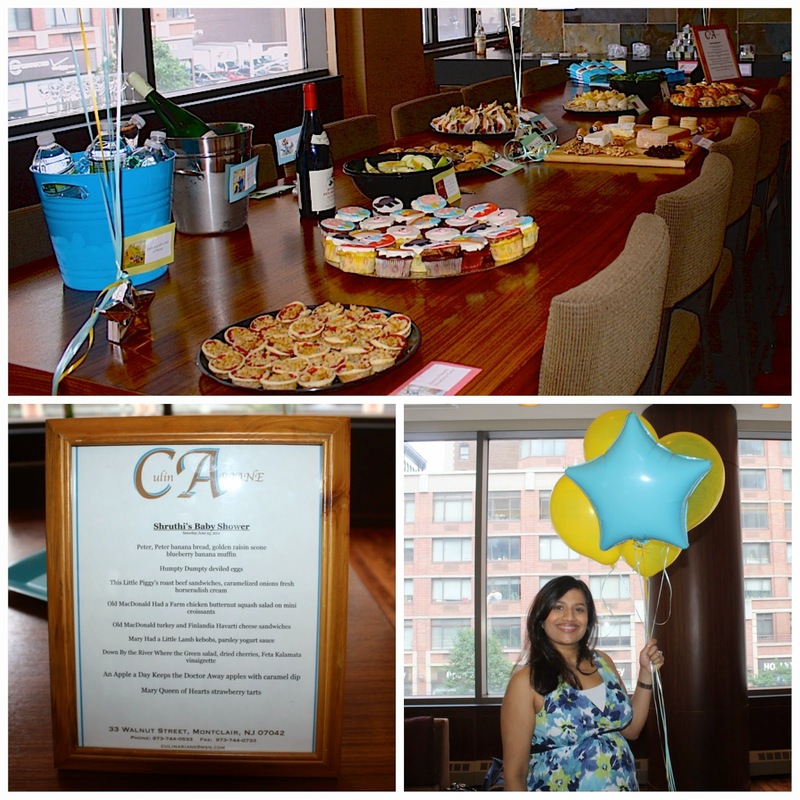 A baby shower isn’t complete without games and prizes. 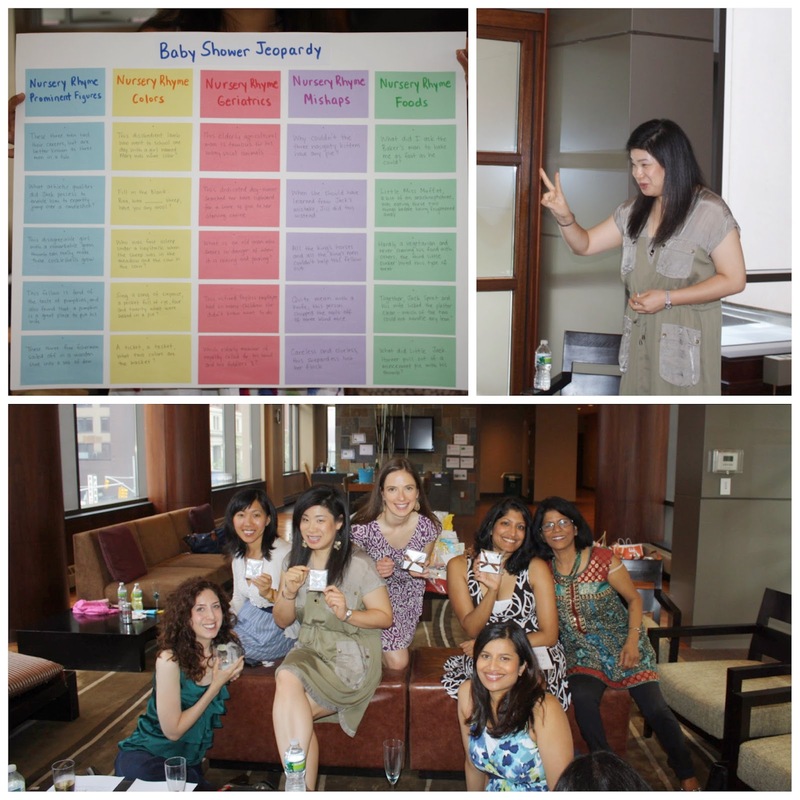 We played Charades, Bingo, Name That Nursery Rhyme and Jeopardy. The most memorable was Jeopardy. We created the Jeopardy game with a few basic supplies from Staples: poster board, colorful index cards, thumb tacs, and a few Sharpie markers. We are not going to lie, this was rather time consuming to put together, but was definitely worth the effort (and the instructions are referenced below). 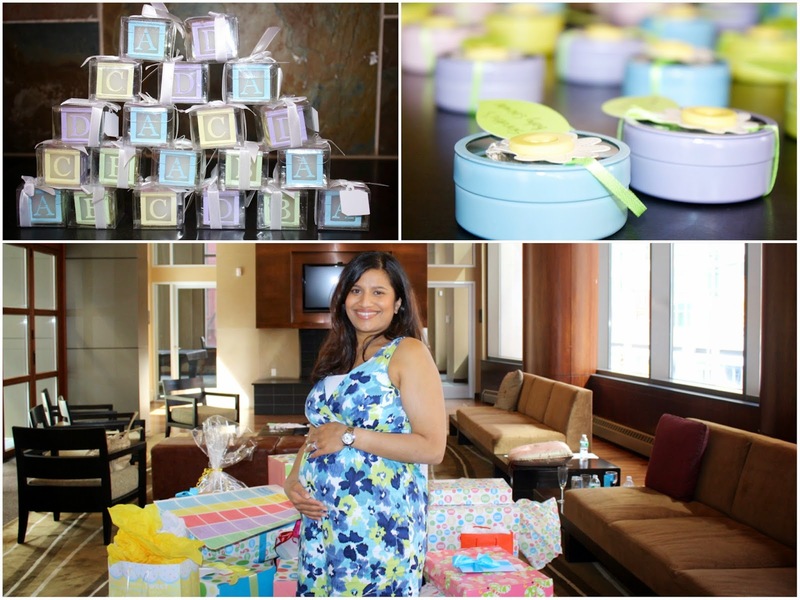 Guests departed with Jack Be Nimble candles and Ring Around the Rosie chocolates (which were filled with adorable blue Hershey Kisses with It’s a Boy tags) to remember Shruthi’s Baby Shower. And this little piggy, Hakkasan. Previous Post Celebrate the Night in Black and White! Next Post Calling All Superheroes!